Calling all teachers, grades K-12! Expand your classroom curriculum and attend CIMCC’s Historical Intelligence training. 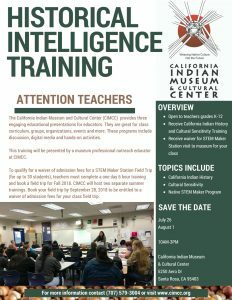 The training will be presented by a museum professional outreach educator at CIMCC. In addition, you will qualify for a waiver of admission fees for a STEM Maker Station Field Trip (for up to 30 students), teachers must complete a one day training and book a field trip for Fall 2018. CIMCC will host two separate summer trainings. Book your field trip by September 28, 2018 to be entitled to a waiver of admission fees for your class field trip. For more information, please email cimandcc@aol.com or call 707-579-3004.